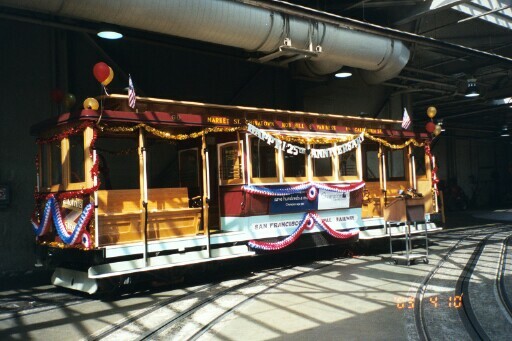 Val Lupiz decorated car 60 to celebrate Cal Cable's 125th anniversary. 10-Apr-2003. Photo by Joe Thompson. There was a nice party to celebrate the 125th birthday of the California Street Cable Railroad. Walter Rice and Emiliano Echeverria signed their new book, San Francisco’s California Street Cable Car; Celebrating a Century and a Quarter of Service, which is available at the Western Railway Museum. Upstairs in the carbarn area, was new car 60, which gripman Val Lupiz had colorfully decorated. Walter Rice welcomed everyone and gave a brief talk on the history of Cal Cable, and its effect on the city's development and growth patterns. He said that the line is still an integral part of the city's economy, and that cable cars are part of everyone's image of San Francisco. He concluded by reminding us that Cal Cable is the oldest operating cable car line in the world, and the oldest line transit using the same mode of operation. Supervisor Aaron Peskin's assistant Rose Chung presented an award to the Friends. Superintendent of the Cable Car Division, Brendan Scanlan spoke about how he has been with Muni for 30 years and had served as both conductor and gripman on the California Street line. 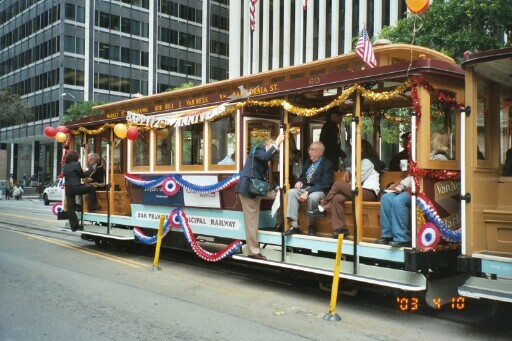 He said that the different cable car lines had their own character, that California Street carries regular passengers, who ride the car every day. Muni General Manager Michael Burns spoke about many improvements which have taken place in recent years, including better on-time performance and the building of 8 new cars. Mayor Willie L Brown, Jr arrived while Burns was speaking. Burns introduced him as the "single biggest supporter of public transit". The Mayor spoke about how car 60 "looks old, but is brand new". He talked about how the cable cars opened up the city, how they were "workhorse instruments that could take the hills". He said he was pleased that Mayor Elmer Robinson had acquired Cal Cable for the city. He mentioned the great reconstruction under Mayor Diane Feinstein. He said how succeeding mayors, including himself, had been protective of the cable car lines, but not as protective as the people who build, operate, and maintain them. 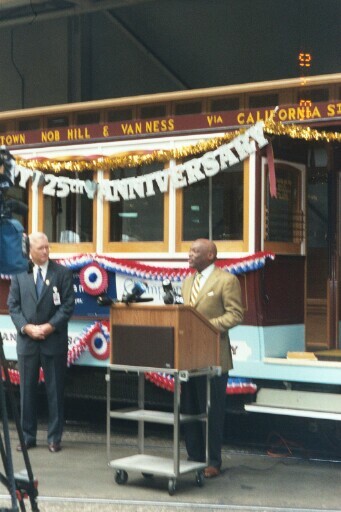 Mayor Willie L Brown, Jr (speaking) and Muni General Manager Michael Burns at Cal Cable's 125th anniversary. 10-Apr-2003. Photo by Joe Thompson. Friends board member Merrill Cohn spoke briefly about the occasion before Walter Rice introduced the other board members, Don Holmgren, Gilberto Godoy, and Jose Godoy. There was a large sheet cake with a nice image of a cable car. After that, many people piled onto car 60, which rolled through a banner across the exit. I had never ridden on a Cal Cable car going into service, so I had a rare chance to ride the non-revenue tracks on Hyde from Jackson to California. The bitterly cold wind played some havoc with the decorations, but the crew worked valiantly to patch them. Many pedestrians smiled and waved, and at least one person shouted "Happy Birthday". I was happy to meet several people with whom I have corresponded for years, but had never met, including Walter Rice, Emiliano Echeverria, and Val Lupiz. I also got to meet legendary Muni man Jack Smith, Carl Payne, who won many bell-ringing contests, Byron Cobb, recent champion, Gilberto Godoy, his son Jose Godoy, who designed the logo and poster for the anniversary, and many other people. Gordon Miller was wearing a vest that said "Second Generation Gripman". He showed me a photo of his dad Fred, who worked for Cal Cable from 1934 to 1954. Gordon talked about growing up in an apartment across California at Leavenworth. 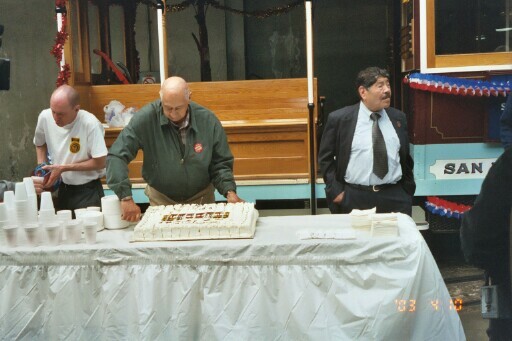 Cutting the cake. 10-Apr-2003. Photo by Joe Thompson. 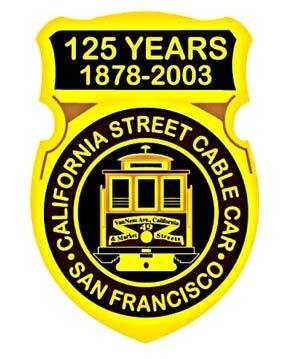 Jose Godoy's Cal Cable 125th anniversary logo. Car 60 at California and Drumm, after the celebratory ride. 10-Apr-2003. Photo by Joe Thompson. Return to California Street Cable Railroad. Copyright 2003-2017 by Joe Thompson. All rights reserved.